There are many people in the Perth area and beyond that require sheds and similar units for a variety of reasons. 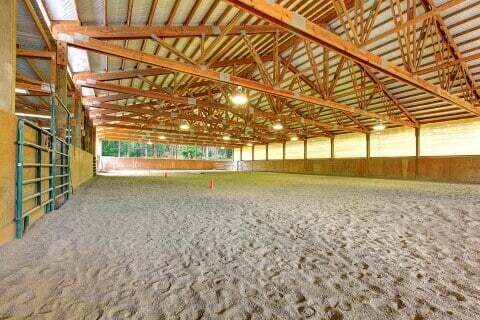 One of these types of units is an arena for horse riding and training, a “must-have” amenity for equestrians or anyone serious about equestrianism. While owning an arena is important to these people, there are a number of things to take into consideration when actually building an arena. One of the first things is the initial dimensions of the arena. You want it to be large but exactly how big is up to you. When it comes to height, the question is raised as to whether you want a ceiling to enclose it or you want to leave it open. There are advantages to both styles. An open arena without a roof or with only partial walls is useful because you don’t have to worry about designing the ceilings too low and there is more sunlight visible during the day, too. An enclosed arena has aesthetic properties but it also allows for extra features such as extra insulation during the colder months and more secure railing options. It also leaves the potential open to use the arena for extra purposes such as a play area for children and large beer gardens. These extra potentials are another point to consider: Do you want your arena to be multi-functional? Arenas often connect directly or are near stables, so making a modification to allow this connection to function better and look better is a good idea. The outward appearance of your arena is also a major consideration. The colour makes a difference because it speaks to your creativity and you want to make sure you get one that you enjoy looking at and can be proud of. Action Sheds Australia can certainly help with all of the planning and execution of building the perfect arena for you. With a full range of custom options and complete palette of colours to choose from, there’s no doubt that you’ll find exactly what you want. With 10 and 15 year structural and cladding warranties, respectively, we’ll make sure that you and your horses enjoy your arena for many years to come. For more information about ordering and building arenas, call us at 1300 778 628.